These lighted stands are perfect for displaying large Natural or Dyed Agate thin slices and showing them to their best advantage. They measure 7.5"H X 5"W X 4.25"D, come with a 6' cord with in-line switch & 7-watt bulb, and can hold thin slices as big as a dinner plate. These 3 prong tulip stands can be used 2 different ways. See larger picture for examples. This display stand was meant for holding large Agate thin slices, thick slabs, fossil plates, and even certain pieces of Amethyst or Citrine clusters. Dimensions 6"H X 5-1/8"W X 5"D.
A small Easel type stand used for displaying slabs, slices, and smaller fossils. 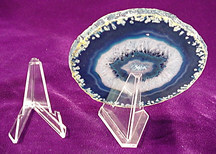 Dimensions are 1 and 1/2"H X 1"W X 1 and 1/4"D.
Another unique stand best suited to display larger Agate Slices, Flourite Slabs, or Fossil Fish. Available in two sizes. Standard size dimensions are 3.5"H X 3.75"W X 3"D priced at $3.00. Large High Back Stand is used for X-large thin slices or fossil plates. It stands 4.75"H X 4.75"W X 4.25"D priced at $4.00. 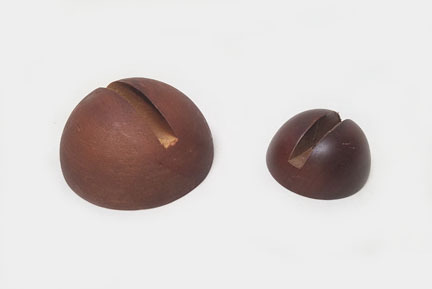 These large circles are ideally suited for holding larger spheres, and stone eggs. It's dimensions are 1"H X 1.75" dia. approximately. 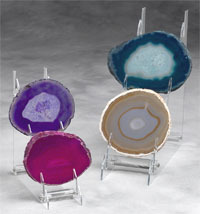 These Round Wooden Slice Display Stands are ideally suited for holding smaller sized Agate Thin Slices. They are available in two sizes. The small is priced at $1.50 each and are approximately 2" long. The large are priced at $2.25 each and are approximately 3" long. This display stand was meant for holding extra large agate thin slices, thick slabs, fossil plates, and even certain pieces of Amethyst or Citrine clusters. 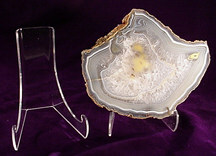 Dimensions 12"H X 9"W X 6.5"D.
This display stand was meant for holding extremely large Agate thin slices, thick slabs, fossil plates, and even certain pieces of Amethyst or Citrine clusters. Dimensions 15"H X 13"W X 12"D.
These large circles are ideally suited for holding extra large spheres and stone eggs. It's dimensions are 1.5"H X 4" dia. approximately. These lighted stands are perfect for displaying #6 Natural or Dyed Agate thin slices and showing them to their best advantage. They measure 4.5"H X 3 3/8"W X 2 3/4"D and come with a 6' cord with in-line switch & 7-watt bulb. 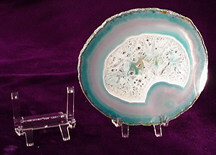 They can also hold the smaller Large Natural Agate Thin Slices. Orders limited to stock on hand (24 each) SORRY, no backorders. 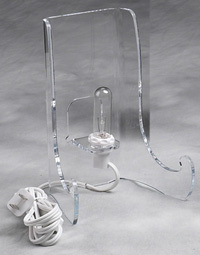 Rotating Necklace Display Fixture, 18"
This Pendant Jewelry Display Fixture has hooks at top to hang your pendants. Display is approximately 18" tall and 8" wide at base. This display holds approx. 48 pendants or chains. Another addition to our sphere stand collection are these dimple sphere stands. 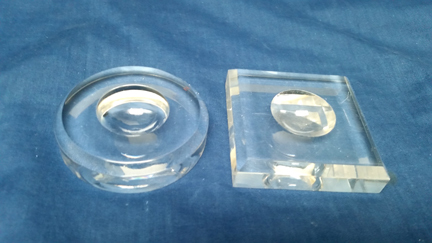 Made from clear Lucite and available in round or square shapes, they offer a nice alternative to our circle stands. 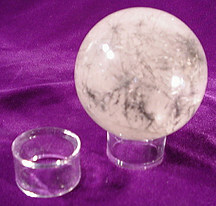 They can be used for spheres in the medium to large range. They are approximately 3" across. The dimple that holds the sphere is approximately 1.5" across. This stand is very good way to display small fossils, slabs, or slices. Dimensions 2"H X 2and 1/8"W X 2 and 1/8"D.
A slightly larger version of the previous stand designed to hold med. to lrg. fossils, slabs, and slices. Dimensions: 2 and 1/4"H X 3"W X 2 and 1/8"D.